Prepare these beautiful cupcakes for Halloween – and your guests will be absolutely delighted! 1. For the dough put an egg, sugar, vanilla sugar, oil and yogurt in a bowl. Whisk until smooth. Add the food colouring and whisk again. 2. I used the red gel food colouring, adding in thimblefuls to a create bright shade of red, then I added black food colouring on the tip of a toothpick to make the colour darker. 3. Add the sifted together with soda and salt flour and knead homogeneous thick dough. Put the dough into molds for muffins and put in a preheated up to 180 degrees oven. Bake until dry matches, for about 25-30 minutes. 5. While cupcakes are getting cool, prepare the custard. Beat butter and cream cheese in a bowl, using a mixer. Add the vanilla extract. 6. Gradually add the powdered sugar and whisk until the mixture is smooth and begins to hold its shape (traces of haloes should be stable). 7. Put the custard in a pastry bag and spread on the cooled cupcakes. 8. Prepare baking paper, grease with a thin layer of vegetable oil. 9. Sugar for glass pour into a thick-bottomed saucepan or skillet, put on medium heat and bring sugar to dissolution, constantly stirring. 10. Then stop stirring and cook at 150C, pour onto the prepared parchment, distribute in a thin layer and allow it to cool completely. 11. Split the ready caramel with a knife and break into pieces carefully, it is really sharp! Decorate the cupcakes with the pieces. 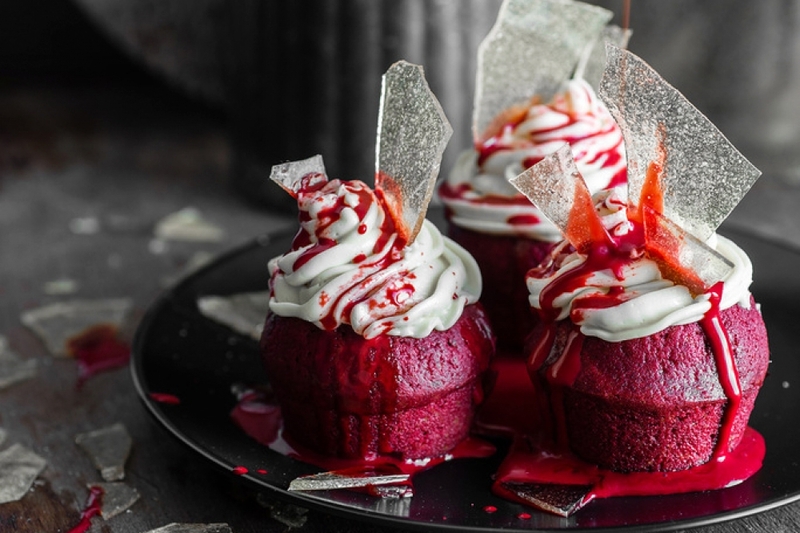 Mix the concentrated milk with red food colouring until bright colors and add a little of black food colouring until the desired hue, pour it on top of the cupcakes.